The LL2 PC Pump is a low-flow progressive cavity pump for polymer feed, chemical feed and sampling/dosing applications. The LL2 PC Pump design has been in use in the chemical injection and wastewater polymer feed now for decades by offering precise, pulseless fluid injection control that only a PC Pump can provide polymer injection in wastewater systems requires a precise dilution if polymer in suspension to work correctly. The LL2 PC pump is in use in many wastewater RAS and TWAS systems in America today. LL2 series pump parts are direct-drop in aftermarket replacements that interchange with the *Moyno® L2 Series, *Tarby® TL2 Series and *Continental® CL2 Series. 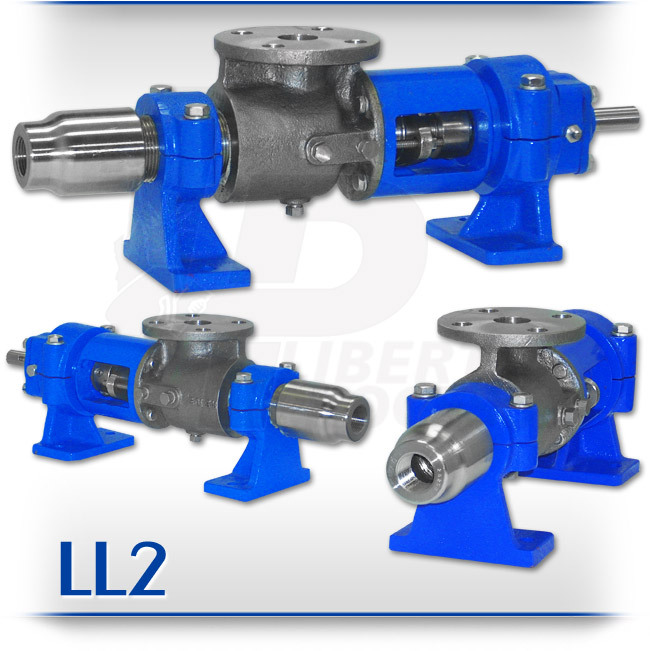 The LL2 is a standard flanged pump with a low-flow design (.260 gpm/100 revolutions) manufactured in cast iron or 316 stainless steel casings and designed in 1, 2, and 3 stages for 60, 120, and 180 psi discharge pressures while the units modular design with simple pinned joint drive assembly makes it a cost-effective choice for low-flow pumping applications. The standard LL2 seal design is a set of gland packing with a Lantern Ring and flush connections. Mechanical seal options are readily available. Rotors are typically hardened tool steel or 316 stainless steel with a hard chrome plating specification. All other wetted parts are either carbon steel or 316 stainless steel. Stators are available in many elastomer materials such as buna, natural rubber, epdm and viton. The LL2 represents one of the most popular progressive cavity pumps available in the wastewater industry. The LL2’s pulseless design has good flow capacity and represents an industry standard in polymer injection for wastewater applications.